The IPCC has been preaching for decades that human souls are guilty of raising temperatures worldwide. Yet the IPCC’s prophecy has not materialized. Why not? Because the high priests of climate science have too little faith. They trust in carbon dioxide, which comprises only 0.04% of the atmosphere, to perform miracles. The reason why the global temperature trend has been nearly level for more than 15 years now as paltry carbon dioxide increased is quite likely explainable by water’s role in climate control. It seems likely that God wisely assigned the role of climate regulator to water in all its phases and characteristics—water in the invisible vapor form, liquid form (oceans, rainfall, clouds), and ice form (glaciers, snow, clouds); water transport and distribution across the globe; and, the energy of conversion associated with water’s phase changes. Because of water’s immense complexity, venerated climate models do a poor job properly simulating water’s role in long-range global climate reality. Yet so many of the faithful continue to trust in the power of man-made “carbon pollution” and continue to fret about “climate justice” nonsense. Advice to Christians: Go tell it on the mountain. Preach the Word, both in season and out of season, for: “While the earth remains, / Seedtime and harvest, / And cold and heat, / And summer and winter, / And day and night / Shall not cease.” [Genesis 8:22, NASB] Now, there’s a long-term, global climate forecast you can really trust. Sadar will no doubt come under attack for that, not only by atheist secularists but, sadly, also by some Christians who naively think religious sources should play no role in shaping our scientific understandings. Two Cornwall Alliance Senior Fellows, David Legates and Roy Spencer, also climate scientists, rebutted their scientific claims, and I provided a Biblical/theological response. What I didn’t do, though, was to point out the philosophical naiveté of Hayhoe and Ackerman’s contrasting “belief” with “science” and their faulty use of Hebrews 11:1 to support it. That, along with explaining the real relationship between religious sources and scientific understanding, is my topic here. What is faith/belief? The late Christian philosopher Gordon H. Clark defined it carefully as “assent to a proposition.” One who assents to the proposition “2 + 2 = 4” believes, has faith, that 2 + 2 = 4. One who assents to the proposition, “A water molecule comprises two atoms of hydrogen and one of oxygen” believes, has faith. One who assents to the proposition “George Washington was America’s first President” believes, has faith. One who believes the proposition “God is a spirit, infinite, eternal, and unchangeable in His being, wisdom, power, justice, holiness, goodness, and truth” (the Westminster Shorter Catechism’s definition of God) believes, has faith. And one who assents to the proposition, “Jesus Christ died for my sins, was buried, and rose again from the dead” believes, has faith, that Christ did those things for him—that is, he believes the gospel. Notice that believing a mathematical proposition, a chemical proposition, a historical proposition, or a religious/theological proposition differs not as different mental acts but solely in the sorts of propositions believed. Consequently, belief in God and belief in global warming are the same sort of act—assent to the propositions that God exists and that the earth is getting warmer. Hebrews 11:1’s traditional English translation, going back to the King James Version, as “faith is the substance of things hoped for, the evidence of things not seen,” is neither clear nor an accurate representation of the original Greek. Does substance there mean the same thing as substance in the statement, “Wheat is the substance of this bread”? What is faith? Assent to a proposition. What is its function? How is it useful? Well, among other things, it pleases God and brings us near to Him. And that is how it is “evidence of things hoped for.” Since faith in God pleases God, someone’s faith in God becomes a ground for another belief: that he will receive or experience things he hopes for—like reconciliation with God and life after death with God in heaven. On the one hand, faith is a mental act—the act of assenting to, believing, a proposition. That is its definition. On the other hand, that faith (faith in God) is also evidence that the one who has it will receive things he hopes for. That’s one of its functions. To refute the notion that Jesus didn’t—and couldn’t—rise from the dead (1 Corinthians 15:12–13), the Apostle Paul offered multiple eyewitness testimony. “Jesus Christ … was raised on the third day.” That’s a historical statement. It’s also a religious statement. 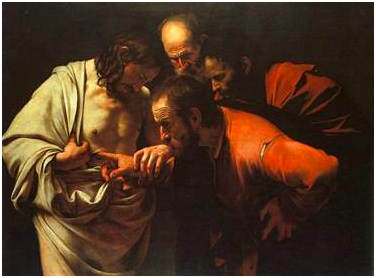 And eyewitness testimony is part of the ground for believing it as both historical and religious, as illustrated in Caravaggio’s famous painting of “doubting Thomas” putting his finger into the spear hole in Christ’s side (after which he was no longer “doubting Thomas” but “believing Thomas”). But notice, too: Paul also says Christ died and rose “in accordance with the Scriptures”—the Scriptures that the disciples were so “slow of heart to believe” until they had seen the risen Christ (Luke 24:25); the Scriptures that were, because they were the Word of God, “more sure” than seeing with their own eyes (2 Peter 1:16–21). Paul wove together empirical observation and divine propositional revelation to make his case—which brings us to our next question. Can Religious Sources Inform Scientific Judgment? Should They? Okay, so there’s no difference in definition between faith that carbon dioxide in the atmosphere absorbs heat and re-radiates it, thus sending some back toward the earth’s surface and so warming it, and faith that Jesus Christ rose from the dead. Each is assent to a proposition. But can religious sources like the Bible assist a scientist in understanding how the world functions? Those familiar with the philosophy and history of science know the answer to that question right off the bat: Yes. Absolutely. Why? Philosopher Nancy Pearcey and biochemist Charles Thaxton, in The Soul of Science: Christian Faith and Natural Philosophy, specify ten ways in which Biblical thought—and Biblical thought alone—served as the soil in which science could grow:1.“To begin with, the Bible teaches that nature is real.” Pantheism and idealism, whether Platonic, Gnostic, or neo-Platonic, see the physical world as illusion and so dampen incentive to investigate it. 8.Christian belief in human rationality and in nature’s susceptibility to rational analysis does not, however, lead, as might first be expected, to the Aristotelian idea that once one knows some things about nature he can derive the rest by infallible deduction. Nature comes with surprises, not because it is inherently irrational but because it is the work of a free and personal God who does with it as He pleases. … Experimental science had to await a shift away from Aristotelianism”—a shift that “began when some Christians became troubled by the Aristotelian concept of Forms” that “appeared to limit God’s creative activity,” a notion that eventually the Christian Church repudiated, leading to the theology of voluntarism, “which admitted no limit on God’s power” and “regarded natural law not as Forms inherent within nature but as divine commands imposed from outside nature.” God’s freedom entailed a nature that required not only deductive inference but also specific observation to be known by man. … there is no formalized method, no step-by-step method by which scientists form their ideas. Sometimes scientists discover things by accident. On other occasions they generate their ideas in more bizarre ways. It is well known, for instance, that E.A. Kekule (1829–1896) came up with the hexagon formula for the benzene ring by having a trancelike vision of a snake attempting to chase its own tail …. It’s not people like Anthony Sadar—or Congressman John Shimkus (R-IL), who cited Genesis 8:22 during a House Subcommittee on Energy and Environment hearing March 27, 2009—who are naïve about the relationship between religion and science. It is, all too often, scientists who may be very good at their practice of science but have inadequately, if at all, considered what the philosophy and history of science tell us about how science actually works. Assent to the proposition that raising atmospheric carbon-dioxide concentration from 27 to 54 thousandths of a percent will warm the earth enough to cause grave harm to humanity and the rest of life on earth is belief, faith. Assent to the proposition that a wise, faithful, powerful God so designed the earth’s climate system that it is not so fragile is also belief, faith. Neither is scientifically privileged. Neither is philosophically privileged. Each must seek its support from a variety of sources, whether divine propositional revelation (the Bible) or divine natural revelation (the creation). And no historically or philosophically informed understanding of the methods of science can exclude Biblical propositions from the evidence to be considered. Ironically, it is those who wish to exclude Biblical propositions from the evidence who are unscientific, not only because they thus fail to comprehend both the history and the philosophy of science but also because they unscientifically exclude, a priori, some potentially relevant data. Temperature readings, chemical analyses of air, readings from the Advanced Microwave Scanning Radiometer aboard NASA’s Aqua satellite, for which Cornwall Senior Fellow Roy Spencer is U.S. team lead scientist, are all data. And so are Biblical propositions. Epistemologically consistent Christians, by taking into account Biblical propositions as well as empirical observations, are dealing not with less data but with more. There is nothing unscientific about that. E. Calvin Beisner, Ph.D., is Founder and National Spokesman of The Cornwall Alliance for the Stewardship of Creation. He edited J.P. Moreland’s Christianity and the Nature of Science for publisher Baker Book House. I have followed Mr. Beisner’s career since he worked with the great Walter Martin. He is a brilliant man and I think he makes some very good points in this article. COLD WEATHER BECAUSE OF GLOBAL WARMING? This entry was posted on Sunday, February 9th, 2014 at 10:56 AM and is filed under Commentary, Creation, Education, globalization, LIFE, Science, theology. You can follow any responses to this entry through the RSS 2.0 feed. You can leave a response, or trackback from your own site. 2 Responses to CAN FAITH AND SCIENCE COOPERATE? This alliance questions the validity of global warming and the spiritual, social, political, and financial ramifications of that. I haven’t seen Mr. Beisner’s series that he has produced in DVD format specifically designed for churches, but I have heard that it is very good. As you have commented, these are basic truths. I also think this information is much needed as “the other side” seems to get much of the press. Always glad when you stop by my friend….